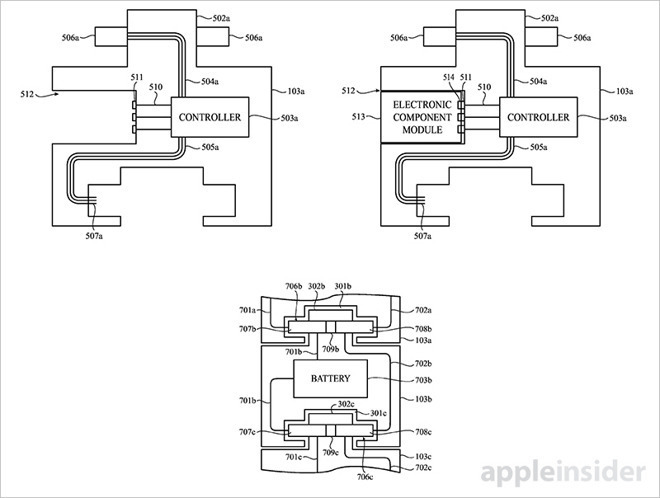 Apple on Tuesday was granted a patent detailing a modular accessories system for Apple Watch that disguises electrical components like batteries, biometric sensors, solar cells and more as links in the wearable's metal band. As granted by the U.S. Patent and Trademark Office, Apple's U.S. Patent No. 9,553,625 for "Modular functional band links for wearable devices" details a method by which Apple can greatly expand Apple Watch's capabilities after initial sale, thus prolonging platform longevity. First published last March, the invention involves modular links that contain working electronic components. The miniature devices are fashioned after traditional watch band links like those found in Apple's Link Bracelet, and attach one to the next via flexible conductive material. Apple mentions a number possible devices for inclusion in the link design including batteries, photovoltaic cells, electricity generators, cameras, haptic output devices, speakers and more. With Apple pushing the Watch platform as a top-notch health tracker, the document expectedly notes any ilk of biometric sensor can also fit into the link format, from blood pressure monitors to thermometers to sweat sensors. Just as the traditional watch link design lends itself to easy-on, easy-off operation, so does Apple's modular accessory system. Each functional link can be thought of not as a standalone device, but as a node in a larger ecosystem. These nodes attach to one another and ultimately to the 6-pin diagnostics port on Apple Watch. Illustration of link attachment mechanisms. With links arranged in serial, the nodes share a common power line —or power delivery circuit in the case of power generators and batteries —and communications bus. Module control is accomplished by assigning unique identifiers to each link. In one example, Apple describes sending an audio signal from Watch through a chain of linked modules. The data travels over the communications bus and activates only those links that match the accompanying identifier code, in this case an attached speaker module. Other embodiments allow for link extensibility, in some cases acting as an external port for interfacing with electronic components like SIM cards or expandable memory modules. Whether Apple is looking to bring a line of modular Watch accessories to market is unclear, but today's patent grant suggests the company is interested in expanding the wearable platform beyond its current capabilities. Apple already addressed complaints from owners of the original Apple Watch by adding a GPS module in Apple Watch Series 2, but the device still relies on a paired iPhone for many tasks. Today's patent could go a long way in making the device more autonomous, and in addressing underlying battery limitations that currently preclude the integration of such features. Apple's modular wearable link patent was first filed for in February 2015 and credits Motohide Hatanaka, Douglas J. Weber, Brian Shadle, Alex M. Lee, David S. Herman, Patrick S. Wieler and Simon R. Lancaster-Larocque as its inventors.